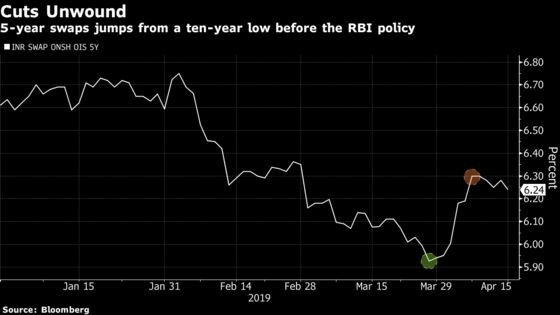 (Bloomberg) -- India’s bond rally is petering out as expectations for more rate cuts by the central bank are fading and the all-important monsoon season comes into focus. Predictions for below-average rain by a private forecast earlier this month has raised the specter of increasing food costs combining with higher oil prices, even as the state-run weather office Monday said the monsoon is likely to be in the lower end of the normal range. That risk may stay the hand of the Reserve Bank of India from adding to two rate cuts this year even though economic growth is weakening, according to ICICI Bank Ltd. Yields of the nation’s most-traded 2028 bonds have advanced by 11 basis points since the central bank on April 4 disappointed traders by retaining a neutral policy stance. On April 3, Skymet Weather Services Pvt. said the June-September monsoon is likely to be weak this year due to the El Nino weather pattern. The weather office does see a more benign scenario, however -- rainfall is likely to be 96 percent of a long-term average, it said on Monday. Rains between 96 percent to 104 percent of the average is deemed near-normal. Last year’s monsoon rainfall was 91 percent of the long-term mean, falling under the met department’s definition of a below-normal monsoon and missing forecasts for normal falls for a second year. Summer rainfall and its distribution largely determine crop output and is among the most important factors in guiding food inflation. India’s consumer-price index rose 2.86 percent in March as food prices climbed, according to data released Friday. That’s the fastest pace in five months. Scarcity of rains may hurt harvests and further boost food prices, which account for about a half of the inflation basket. The monsoon outcome and its impact on inflation will be among the major factors guiding RBI policy, said Prasanna. “The bond curve is likely to steepen further as there is no immediate visibility of a cut,’’ he said predicting the 2028 bonds may trade in 7.35-7.60 percent range till June. To navigate this difficult environment, ICICI Bank reckons the best trades are short-end bonds with maturity up to five years as compared to the benchmark 10-year bonds, corporate paper and state government notes. The 10-year bonds “has to face a lot of headwinds” for the year, he said.